FanGraphs threw me a real curveball this week, publishing a new projection system on their website that, to my knowledge, has never been publicly available before. Named "Average Total Cost", or ATC, this system is a composite projection that makes use of historic stats and several other projection sources, weighting each of them category-by-category based upon historical accuracy of each system in each category (described in full detail here by creator Ariel Cohen). Annoyingly, they have not made past years' projections available, so at this point it's hard to evaluate how accurate the system is! But, composite systems generally perform quite well, and so I've gone ahead and loaded this guy into the newest version of the Big Board and put it through its paces. One initial reservation: ATC weights recent performance (i.e. 2016) a bit too heavily. Players that had breakout performances last year, or were injured and performed poorly, seem to be overly pumped up or down. That said, I find myself agreeing with many of the players ATC likes and doesn't like. The same guys that I have adjusted up or down in my custom Big Board projections also tend to be adjusted in that same direction by ATC. Matt Carpenter put up a .233 ISO in a 2015 power breakout, and matched it with a .235 ISO in 2016 despite being hampered by an injury. I buy the new power, and so does ATC, which is the first projection system I've seen that's giving him an ISO in the .200's (Steamer: .177, ATC: .222). That turns into a nice boost across the board in HR, R, RBI, and AVG, and moves Carpenter up about 50 spots, solidly a top-50 or top-60 player. If you had ten guesses for a guy who was top-25 in Hard% and led baseball in FB% by over 10 percentage points in 2016, you would not pull this one. It's Ryan Schimpf, of course! If he's not hitting dingers, striking out, or popping up, it's probably because he's sitting against lefties, and if he didn't play for the terrible San Diego Padres, he probably wouldn't be getting a shot as a 28-year-old prospect. But, lucky for us, the Padres ARE terrible, and he turned that opportunity into 20 HR in half a season last year. Relative to expectations, I think all the projection systems generally like Schimpf's chances in '17, but ATC is just a bit higher, and I'm inclined to believe it as Schimpf has consistently shown up as a champion of my statcast-based xFantasy stats. 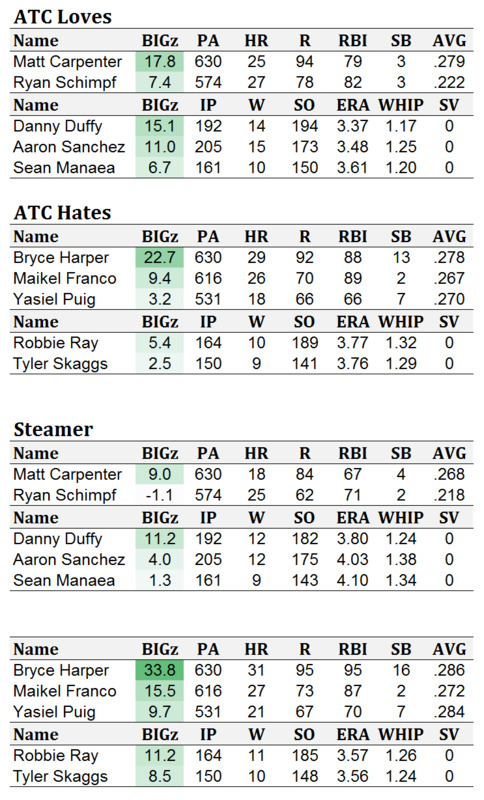 ATC likes Danny Duffy, Aaron Sanchez, and Sean Manaea significantly more than Steamer. Again, much like I pointed out in my commentary for ZiPS, ATC seems to weight recent performance much more heavily than Steamer, and these are all guys with recent positive spikes in big-league performance. For what it's worth, I also like all three better than their Steamer projections. Duffy pulled a Carlos Carrasco move last year, pumping up his velo and K% in the bullpen before returning to the rotation new-and-improved. That said, the velo fell off as the season wore on, and after his insane Aug. 1st start (8IP, 16K, 1BB, 1H, 0ER) he struggled through an erratic final two months (71 IP with 4.31 ERA, 4.77 FIP). He's no sure thing to be an ace in '17, but he should be better than his Steamer line which is overly influenced by poor performances in 2015. Manaea pulled the opposite move, closing very strong from July 10th onward (84 IP with 2.44 ERA, 3.58 FIP), powered by big improvements in his walk rate and home run rate. His flyball-heavy approach plays well in Oakland, and I like his chances to keep improving in '17 while putting up something closer to a full starter's workload (~185 IP). Which of these two players will be better in 2017? Place bets now. These two teammates put up incredibly similar numbers in K%, BB%, Hard%, and GB% across 200 IP apiece last year. The first player managed a better performance in each of the trinity of luck stats, with a sub-.270 BABIP, better LOB%, and league-average HR/FB rate. The second player pitched a few more innings, had a better K-BB%, and better groundball rate, with a SIERA nearly 0.4 lower. For those playing along at home, we're talking Aaron Sanchez and Marcus Stroman, here. I'll be targeting Stroman in drafts, and letting someone else deal with finding out just how far Sanchez's ERA will regress. Bryce Harper falls victim to ATC's over-exuberant weighting of 2016 stats. It's all but confirmed at this point that Harper played through a shoulder injury last year. I'm buying our chances of seeing a return to the Harper that put up an 1.109 OPS in 2015, potentially with the added bonus of those 15-20 SB's. The biggest problem I had with Maikel Franco after his 2015 breakout was the insane 14.8% IFFB rate. It's not often that you get a player with good power that strikes out as infrequently as Franco. Then last year, he moved backwards in pretty much every direction, chasing more, hitting for less power, and popping out even MORE than his first time through the league (17.1% IFFB). Sure he had just a .271 BABIP last year, but when you're popping out that frequently, the low BABIP is real. Until we see signs of Franco moving in the right direction, I'm out on him, so I've bumped his projection down much like ATC has. Yasiel Puig, what to do with you..? Anyone that tells you they know is full of it. This is not a question of projecting skills, it's a question of projecting a volatile personality/health/playing time situation. Steamer's projecting him for too much, so I'm certainly bumping him down from there, but I'm still interested enough in Puig to take a flier on him in the later rounds this year. Finally, the pitchers ATC hates, Robbie Ray and Tyler Skaggs. I actually see both of these as very reasonable projections. This is a case where I believe Steamer is seeing nice K-BB rates for both players and projecting vast improvements in ERA. Robbie Ray, in particular, is a player that very well could breakout, should he somehow learn to limit hard contact or strand runners, but until then will run a Pineda-like differential between his run-predictors and his actual performance. With Skaggs, we'll have to hope that a few more months removed from his TJ surgery will mean he can recapture his previous control. I'm keeping an eye on him in spring training to help decide what to do with him this year. What does everyone think? Is Steamer more right on these players, or is ATC? Are these players you want or players you're avoiding? Older PostZiPS released: Who do they like? Who do they hate?